This Corvette Action Center you see here originally started out as a small New Hampshire based Corvette web site and has been under development since January of 2000. The site actually went live on the web on April 1, 2000 and our Community Forums were started September 16, 2000. 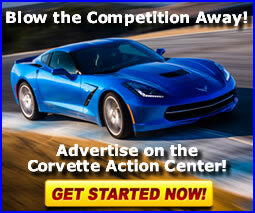 Forums: The Corvette Action Center Community makes up one arm of the site. The forums provide owners and enthusiasts with a sense of home, camaraderie and technical information on anything and everything Corvette related. It is one of the most important sources of information that the Corvette Action Center is built on. History: Our History Center is the perfect place to go to research the history of the Corvette since it went into production in 1953. Section include biographies on who's who in the world of Corvette, Press Release Archives, Timeline and much more. Portal: The Corvette Portal Project is the second arm of the Corvette Action Center and began in August, 2001. Our goal with the Portal is to provide owners and enthusiasts with the largest collection of Corvette related web site links on the internet. The main highlight of the Portal system is that each site....each repair and restoration shop, Corvette book, parts supplier, dyno-shop/performance tuner...etc., can be rated and reviewed by YOU. If you've had a good experience with one of the businesses listed there, let others know about it. If you had a poor experience, make your voice heard by casting an appropriate vote. Corvette owners and enthusiasts value other owners' and enthusiasts' opinions and this is one of the most valuable Corvette related resources on the web today. Gallery: The Image Gallery has been constructed to give the user a pictorial history of the Corvette by utilizing high quality pictures of Corvettes through the years. Knowledgebase: This is the second most important source of information we have in the Corvette Action Center. The Knowledgebase was released to the site in January of 2002. This section is divided up by Corvette generation and then into major subcategories that cover the main areas of the Corvette such as "Body Parts and Trim", "Electrical and Ignition", etc. The information contained within comes from Chevrolet/General Motors Service Bulletins, Chevrolet Service News, and other reliable sources of information. This is one of the sections of the site which is in a "continuous state of improvement". As more information becomes available to us, the Knowledgebase is updated appropriately. Research Center: This is the third major section of the Corvette Action Center. It provides specifications, production codes, VIN code information and performance reviews for all model years of Corvettes and specialty models. This section along with the Forums and Knowledgebase make up the heart of the Corvette Action Center. Toolbox: In this section, we put together several helpful tools to help the present and prospective Corvette owner. Some of these tools include a Cost Comparison Calculator, Carburetor CFM Calculator, Horsepower Calculator and much more. With the Forums and Knowledgebase and Research center making up the heart of the site, all other sections make up the body. We feel that this structure provides an efficient and easy to use online resource and allows the Corvette Action Center to be one of the most important informational assets to Corvette owners and enthusiasts. As always, we take pride in offering an informative and easy to use Corvette web site. We value feedback and do our best to take user feedback into consideration when working on the site. Please feel free to provide any suggestions you may have by using our online Contact Form. Thank you and remember: "Save The Wave"! !